Heat some of the oil in a saucepan on a medium to high heat. Fry the onions until they are glossy. Add the spices and give everything a good stir. Add the tomato puree and garlic puree, then cook through for 1 minute. Add the beans and stir to coat in the spices. Turn the heat right down and simmer with the lid on for 5 minutes. Add water if needed. Prepare the avocado and gently mash it using a fork. Squeeze in some lime and season with salt and pepper. Place the tortillas in a dry frying pan and heat both sides for a few minutes until they have a bit of colour and become crisp. Fry 2 eggs with the rest of the oil. 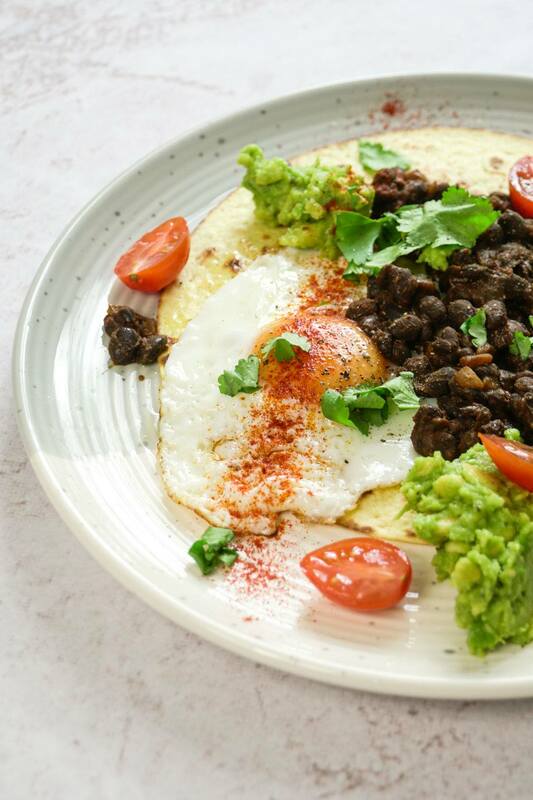 Place the tortilla on a plate, add the egg, followed by the bean mixture along with the smashed avocado, sliced tomatoes, coriander and a lime wedge. Sprinkle some smoked paprika across the egg. Serve and enjoy!